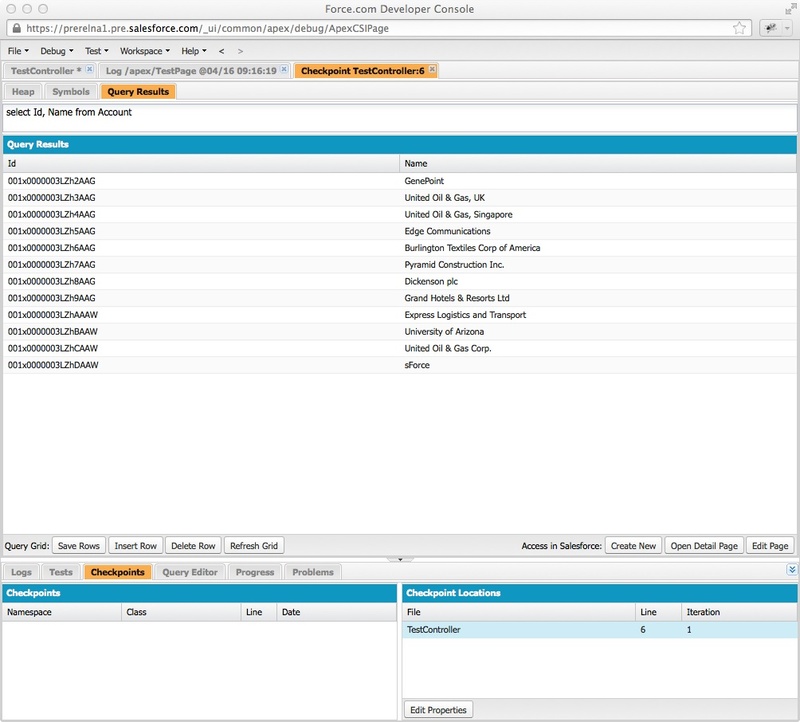 Quick post highlighting some Summer ’13 goodness for metadata deployment. 1. Abort a running deployment – This is a massive improvement enabling failed or inadvertent deployments to be cancelled whilst in progress. Anyone working on large deployments will bear witness how frustrating it can be to watch a 30 minute deployment run to completion with a failed unit test occurring after 5.. 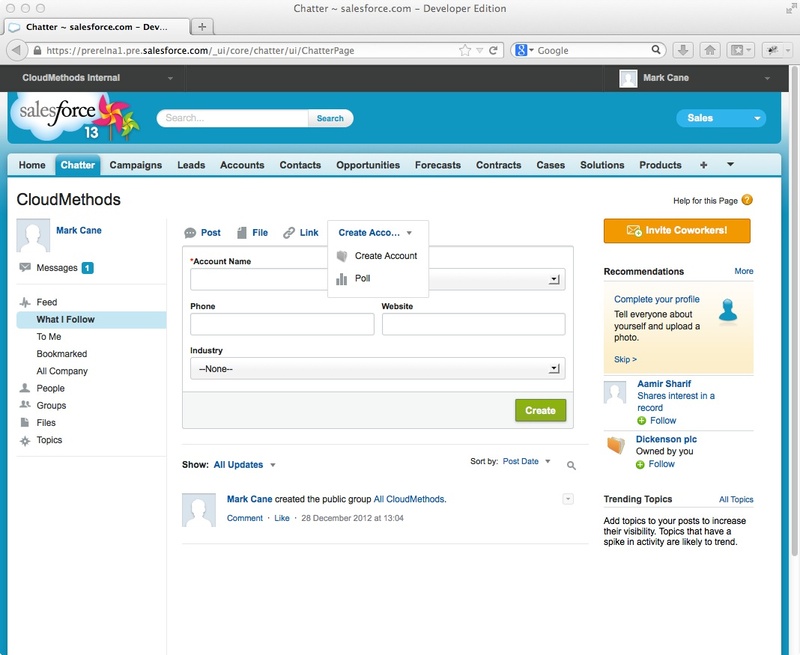 The Abort option appears against the running deployment in the Salesforce web UI. There doesn’t appear to be an abort operation via the Migration Tool or underlying Metadata API. 2. User references are maintained – Simply put, where individual user references (email alert workflow actions, running users etc.) exist in the metadata, the deployment process attempts to match the source usernames to existing target usernames, by stripping-off sandbox suffixes added to sandbox usernames. This is great for sandbox to production deployments, but needs to work with sandbox to sandbox deployments also – the documentation is unclear on this aspect, although it looks likely that this is supported. Multiple match or non-match cases result in a deployment error. I’ve previously used Post-Retrieve Modification via Ant to deal with this through simple string substitution. 3. Metadata API Supported Types. 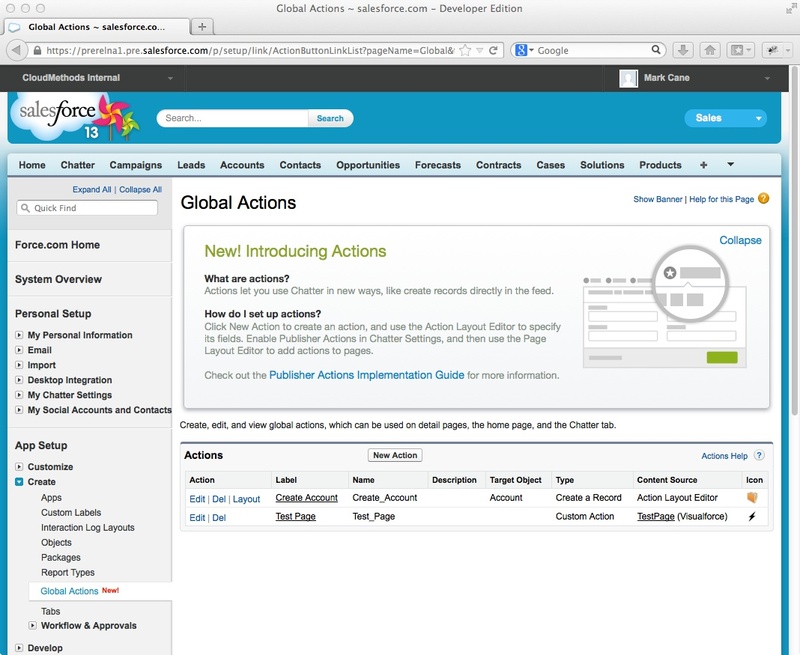 New additions include Approval Processes and SAML SSO configurations. The former being long overdue as approval processes can be extremely time consuming to recreate manually in a target org. The latter provides a minimal convenience for cases where multiple orgs share the same IdP. My first post on this blog back in March 2012 related to Simulated Breakpoints, a developer console feature enabling a head dump to be captured when code execution hit a specified line(s) of Apex script. Whilst not comparable to the power of breakpoints in debugging with other languages, Simulated Breakpoints was a definitely step forward for Force.com development, but I suspect this still remains an unused feature, with System.debug() statements being used instead. I don’t believe too many developers are juggling the Force.com IDE and Developer Console, which is unfortunate as the latter provides features and metrics not supported by the IDE. In Summer ’13 Simulated Breakpoints are now termed Checkpoints and can be set on lines of Apex script in the same way using the code editor (now with syntax highlighting) within the Developer Console. In addition to capturing a heap dump, Apex script or SOQL query Execution Actions can be added which run when code execution hits the Checkpoint. Very useful in determining state of the execution context and in particularly in debugging data related issues. 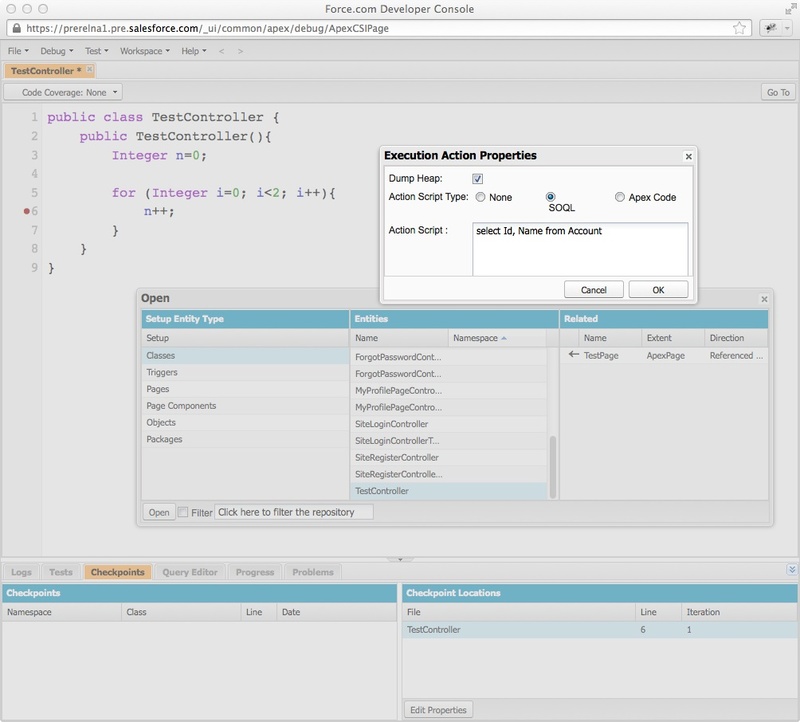 In the screenshot below we can see the new Developer Console UI for Summer 13, the Checkpoints tab and the definition of an example SOQL query Execution Action which will run when the Checkpoint is hit. In the screenshot below we can see the result, when the Heap Dump log statement is double-clicked a Checkpoint tab is revealed with subtabs that show the Heap Dump itself, plus the result of defined Execution Actions. Note, I was unable to open the Checkpoint results where an Apex Execution Action was defined, from the log activity it does appear to run as an Execute Anonymous block, but it isn’t clear if the user context is the debugging user or the running user.